The well water situation in Goldsboro, North Carolina keeps on getting lots of press. That’s probably because a lot of well owners are potentially affected by contaminants coming from a stormwater pipe that ruptured over a year ago at a retired Duke Energy plant. Following water testing done by a professional lab, the well owners in this area are being told to NOT drink their well water. 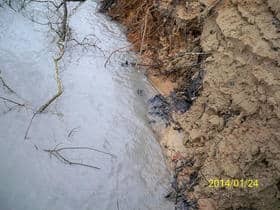 At the same time Duke Energy is saying any elevated levels of contaminants aren’t coming from them since the ones that would come from coal or coal ash aren’t in that group. I’m sure the well owners affected aren’t very happy after hearing all of this. It will take years of cleaning up, capping and/or disposing of, the coal and coal ash ponds in the affected plants. We sure hope the people who live in and around these areas come out of this ‘clean’ healthwise. Well Owners Need to “Take Control and Manage the Quality of Their Well Water” ! Most well owners will not have have anyone else making sure their well water is safe unless there is a known breach like the one in Goldsboro. Contaminants could be seeping into their well and they wouldn’t know it. The great majority of well owners think their water is safe because it looks clear, doesn’t smell, and tastes just fine. The problem with this is that the things that could literally be killing them are not visible, do not smell and have no taste. Some of these contaminants, like pathogenic bacteria, can be harmful in the short term. Others, like some heavy metals and volatile organic compounds, will start to affect the body several years out. …we are strongly encouraged to get an annual physical, right? The doctor not only examines us for the things they can see, but they also have our blood tested for the things they cannot see. If the blood test shows something is not quite right, they can either prescribe a treatment and/or monitor its level from physical to physical. This is the same principle we advocate for well owners. Become your own water doctor and perform an annual water ‘physical’—start now with your first one! You can read the full article about the well water problems in Goldsboro, NC here: Goldsboro NC Well Water Contamination. Learn more about well water testing at our site, Drinking Water Specialists.